It was time for my wife and I to finally get away for our annual autumn trout excursion. With family thanksgiving obligations out of the way, we headed northwest an hour before the sun was to rise. We were off to the Duck Mountains and Parklands region of Manitoba for four days of fishing and relaxing and we couldn't wait to get up there. After the beautiful prairie sunrise was behind us, there were plenty of sights along the drive as we watched thousands of geese heading south overhead and dozens of hawks perched on hydro poles or bare trees. 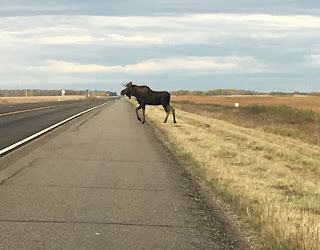 The highlight of the wildlife sightings was a young bull moose by the road. We kept our distance, but took more than a few pictures. The traffic was reasonable for a holiday weekend and we arrived at our destination shortly before lunch, ready to fish. 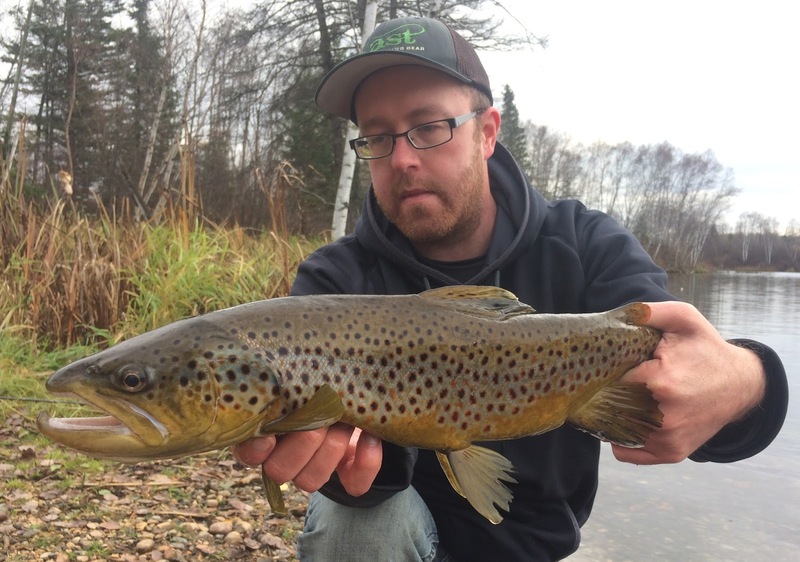 Our plan was to meet up with a friend and do some shore fishing from multiple lakes for the many different species of stocked trout this part of the province offers. 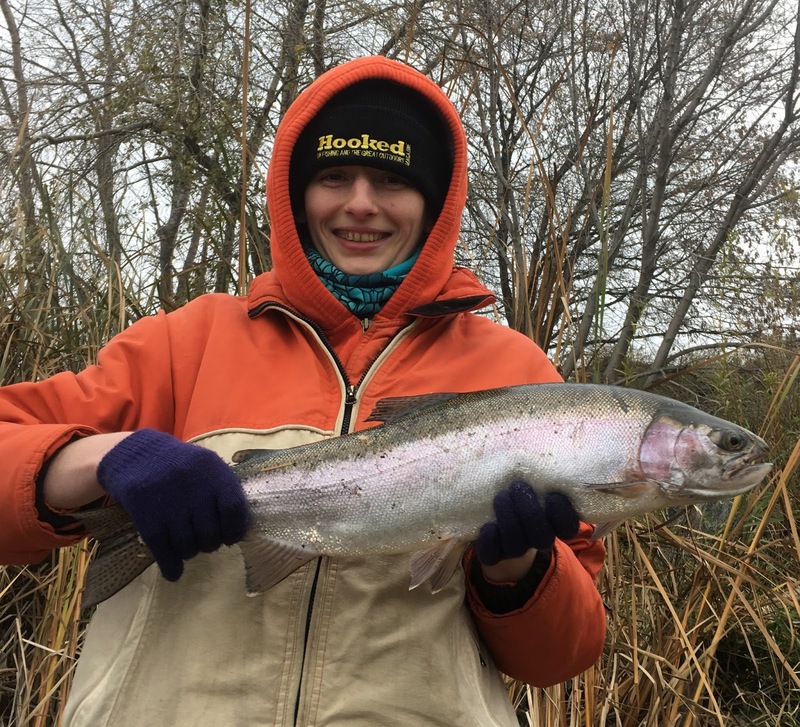 Over the 30 minutes of fishing before he arrived, my wife managed to catch and release two rainbow trout under 20 inches in length. The occasional trout would breach in the area we were fishing, so when Justin showed up we agreed to give it an hours fish. With minimal activity over the next 60 minutes and only so many hours of daylight left, we decided to push on to our next destination in pursuit of tiger trout. Within an hour of fishing the lake my wife and I each hooked into and lost a tiger trout. Both equally acrobatic and wily, they ran for cover and weeds, jumped and thrashed and both managed to get free. Hers clearly dwarfed mine in comparison and appeared to be over two feet in length when it breached the surface. "You gotta lose a couple," was Justin's response to my frustration and I quickly tried to adopt that attitude and got right back to fishing. 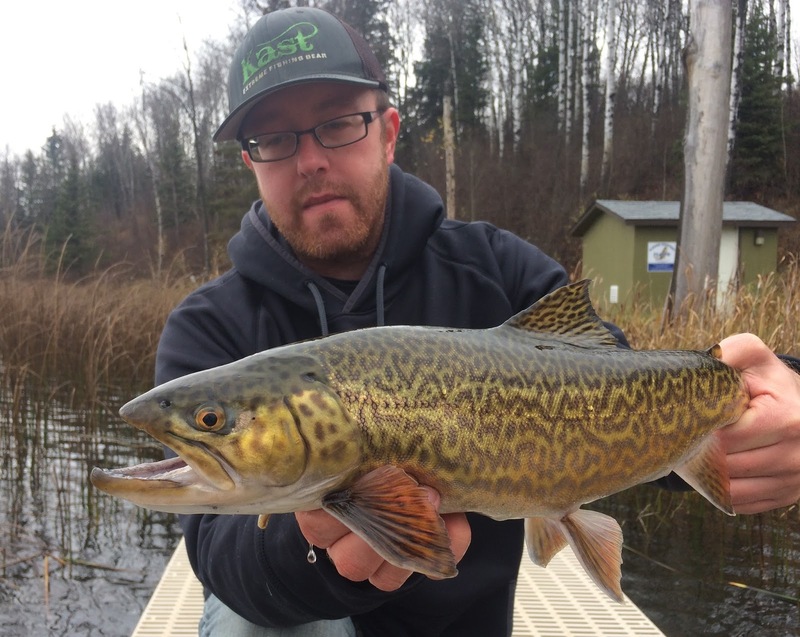 Justin managed to bring one to shore on the fly and it was a true treat to see a tiger trout again. Knowing we had a few days up that way and had plans to put more time in on the lake in the days ahead, we decided to head off while still having enough daylight to check out a few more lakes. Trying two more lakes with minimal success (Justin landed a brown trout), we ended up at a lake known for big trout of a few different species. With 45 minutes before dark and the wind in our favour, it was prime time and someone was bound to hook up with a fish. That someone ended up being me. The fish smashed my spoon on the second cast, pulling line with relative ease. 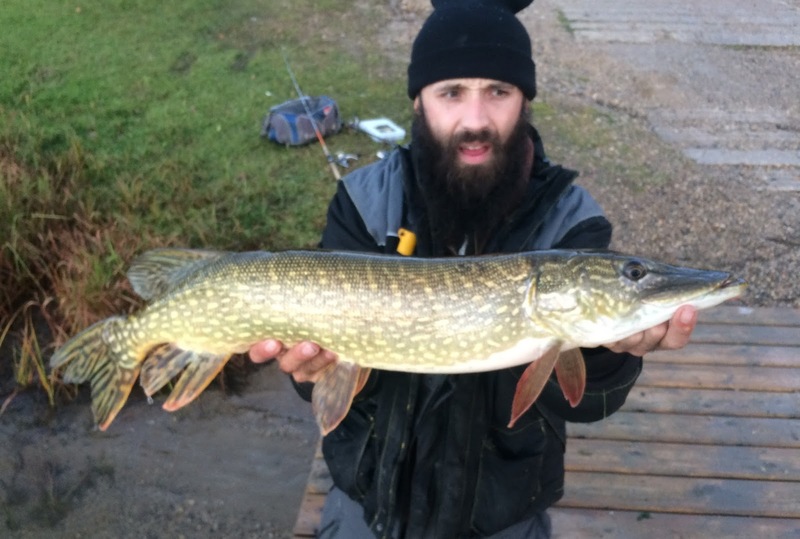 My knees were week and excitement was peaking as I worked the fish towards the shore, when we saw it was a pike. Out of all the fish in the lake and the multiple species of trout, a pike had to be the one to hit, I could not believe it. With darkness on it's way, we took a glance over the weather forecast and a plan was formulated for the following days fishing. As the sun dipped below the horizon, my wife and I headed off to our motel to warm up, eat and get some rest. Sleep came with relative ease, as trout of all different species filled my dreams and expectations were high for the days to come. Day two began with a similar plan of attack. The weather wasn't to favourable, but with enough layers of clothes we would be fine. A few rainbows were landed in the morning before we headed off to try other lakes with my wife getting a 23.5 inch rainbow trout as the biggest. This area of the province has so many different lakes within relatively close proximity to each other with some having more shore access than others and we were willing to put the time in where and when we could to learn and experiment while trying to land trout of a few different species. We met up with Justin again and with some driving and hiking, we covered a few lakes and spots, with not much to show for ourselves as far as trophy trout landed. 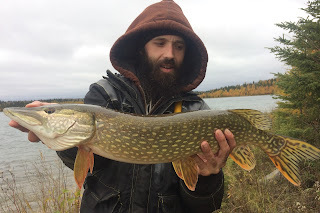 Again I was able to land another pike of all things that had my heart racing as hard as the fight the night before ... until it showed itself. If those pike were trout of any species and similar in length, I would have been ecstatic. Soon after the weather quickly took a turn for the worse and as the temperature hung around zero, some snow had moved in from the north. Before we knew it, the surrounding area was covered in a few inches and it was time to make the long trek back to the vehicles through the forest before the weather got any worse. 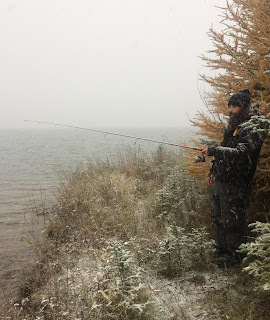 With wet snow still coming down and road conditions deteriorating, we left the lake ten minutes ahead of Justin, it wasn't long after that when our vacation led us somewhere we had not planned. I will spare the details of the accident and just say that we are lucky to be alive and relatively unharmed! Vehicles are replaceable, lives are not. Lucky for us Justin wasn't too far behind and was able to get us and our fishing gear back to our motel safely. With the fishing plans for the next few days now out of the picture, we were just glad to be alive and somewhere safe. Now we had to figure out retrieving the vehicle and finding a way back home, 450 kms away.